While no beverage will do the work of weight loss for you, adding coffee or green tea to your weight-loss plan may enhance your results somewhat. That said, the key to slimming success is still to reduce food intake and engage in regular exercise. Only by consuming fewer calories than you burn for energy will you lose the weight and keep it off. Both coffee and green tea contain caffeine, which may increase your metabolism, the speed at which you burn calories. Weight loss from caffeine may only amount to about 1 pound per month, however, according to Columbia Health. Plus, caffeine may cause nervousness, insomnia and other side effects -- especially if you consume more than 200 to 300 milligrams per day, considered moderate intake. Coffee contains about 100 milligrams per cup, while a cup of tea may have 14 to 60 milligrams of caffeine. 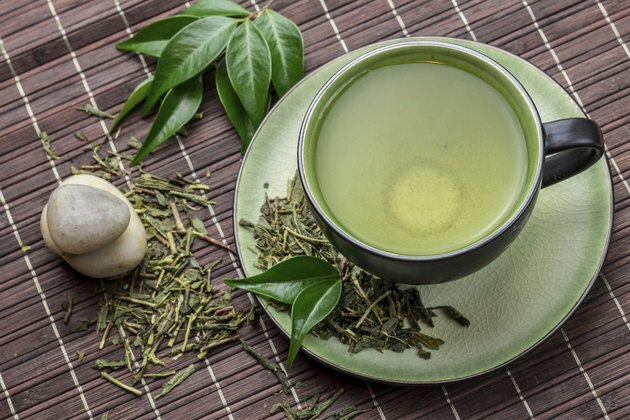 Green tea contains antioxidants called catechins, which might provide an added weight-loss boost. Catechins appear to be most effective when combined with caffeine, so decaffeinated teas may not be much help. In a study published in the "Journal of Nutrition" in 2009, subjects were either given a beverage containing both catechins and caffeine or a drink only containing caffeine. Participants were also asked to get at least 180 minutes per week of moderate exercise and maintain a steady diet. The caffeine and catechin group lost more weight than the caffeine group and also lost more abdominal fat. Although more research is needed, some evidence shows that chlorogenic acid from green coffee beans -- regular coffee beans that have not been roasted -- may provide some weight-loss benefit. In a study published in "Diabetes, Metabolic Syndrome and Obesity Targets and Therapy" in 2012, participants were given either green coffee-bean extract or a placebo over multiple treatment periods. Researchers found that subjects lost significant weight and body fat while taking the green coffee, even without any dietary changes. While there's nothing wrong with coffee and tea, the best way to ensure a slimmer waistline is to reduce calories and exercise most days of the week. Choose filling, low-calorie fare such as fruits and vegetables, whole-rye bread, whole-wheat spaghetti and oatmeal. Protein-rich foods such as black beans, salmon and low-fat cottage cheese will also keep you satisfied, as will small amounts of fat from nuts, avocados and canola oil. Rather than dieting, focus on incorporating these choices into your everyday life -- this will make it easier to maintain a healthy weight for good. Columbia Health Go Ask Alice! : Energy Drinks and Weight Loss? Is Coffee Good to Drink While Dieting?